Manali, just like many other cities, is just another city. Being a hill station, is what makes the places you have in Manali, differ from the ones you might find at other such places. 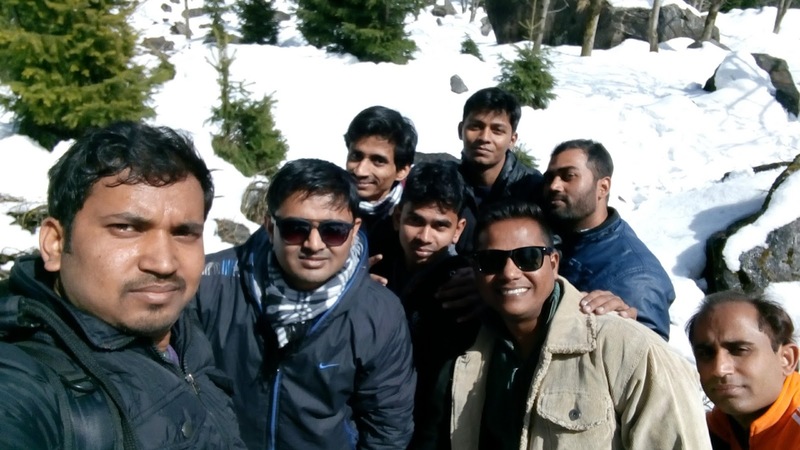 Now, since the features are different, what I feel is that there's not too much to explore here in Manali, however, whatever that is there, it's worth spending time in. 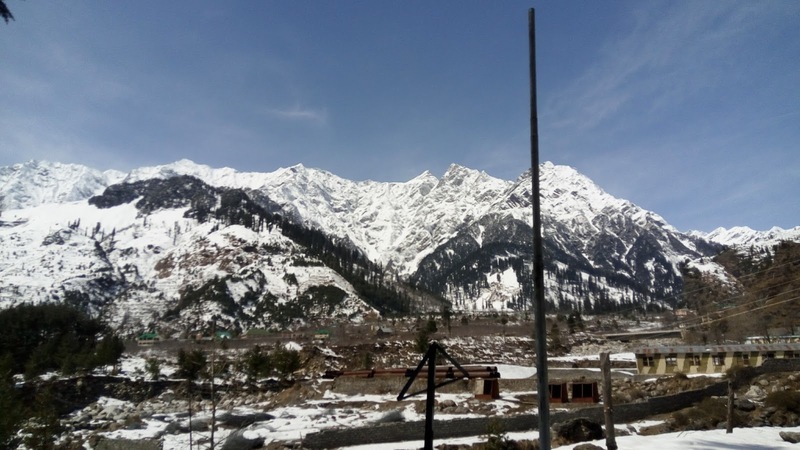 Solang Valley can be one of the places, high above in your Manali Bucket-list, if you are an adventure lover, and infact even if you aren't, just think about the reason you're here in Manali - Snow? Approximately 12 kilometres, from the Mall Road, as the taxi drivers tell you, Solang valley is THE spot, if you plan anything from Skiing in the ice to Parasailing, want to enjoy the beauty from up above the heights, with the help of the Ropeway which takes you high above near the mountain peak, or just plan to get your hands dirty in the white snow that appears like tonnes and tonnes of white crystalline particles of salt. You'll gets lots of snow if you are heading out to there at the right time, then you will definitely be lucky with lots and lots of snow covering the mountain sides, giving you ample scope for playing in there, building snow-man, if your hands are resilient enough to the extremely cold snow, because, you won't find anything to help you build it. 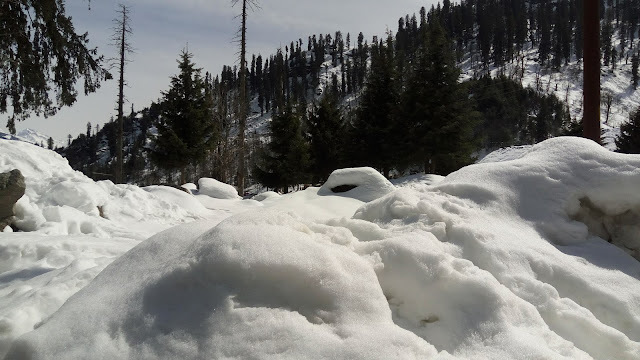 What's stunning is this white expanse of snow, something that covers the low vegetation cover majorly that of spiky pine trees, low shrubs of which are extremely dangerous, as the leaves turn into thorns once they dry up and if you by any chance happen to fall in the wrong place, you can get grievously injured. 1. Have ample clothing that suits the conditions. Water resistant fleece jacket should be your top priority. It's good to have woolen gloves though, you will anyways have to remove them whenever you want to play in the ice, you can't risk wetting them, or they'll be useless. 2. A much as possible, do try wearing trekking/hiking boots. At some point in time, I was regretting having put on regular sports shoes. There are vendors there who provide you with rubber boots on lease, that they claim will help you play safe in the snow, however these are just useless. The small shoes do in fact make the task harder if you happen to have tried this in thick snow as the snow will simply get inside the shoes from the top, and it will be much more uncomfortable than your regular sports shoes. Do ensure that whatever footwear you wear, it should have good soles to help you gain traction on the slippery snow. A great hack, as a friend, who had visited earlier as well, told, was to have your feet covered within long and thick layers of polythene bags, two if possible, which save your feet from getting wet, even if snow somehow manages to wet your shoes and the water seeps inside. The way it should be is, you wear your socks in your feet and, the polythene bags above that. A thought came to my mind, why couldn't I have the polythene bags cover my shoes, which was a bad idea, as wrapping polythene will make your footwear slippery, and you're sure to fall more often than normal or might get hurt as well - I was wrong, and luckily got off unhurt after thinking this brilliant idea. 3. Do carry a bag with some snacks and atleast a bottle of water. Water is important since you might spend time playing in the snow, which will make you tired and you'll need water. It's not that easily available there, unless, you are at the right spots, and then also, water bottles here don't come cheap. 4. Do rent out the sticks that are on offer there. These will come handy while walking through thick snow. You will need additional help as walking on thick snow could be tricky at times, especially when you are descending. 5. While you reach the summit, The Ski point, do make it appoint to bargain with the vendors there. You can get them to offer you around 10 minutes of skiing course for almost half of the quoted price. You get to spend time on skis and you can also do para-gliding, which is costly, and non-negotiable, but is an experience of a lifetime, if you can spend close to 4000 bucks per person. 6. Do carry sun screen if you plan to be out there for a long time. White snow paired with extremely powerful sunlight can give you lots of sun tan, which will darken your complexion, just within a couple of hours. 1. During months with heavy snow, the pine trees, leaves of which are thin and sharp, as the pine trees get covered with lots of snow the leaves get buried under this snow and turn into pricks. There are two possibilities. One is, you might get stuck in snow, which looks like solid from far away, but is actually burying a pine tree underneath and has lots of space within. Another possibility is you getting injured by the pine leaves converted into pricks, and believe me when I say it hurts, and hurts very bad. Since there’s a big possibility of getting injured by these pricks, please do carry something to take out those pricks as soon as possible for you or these might turn very bad. 2. Do not pick up the gum boots on offer. These will make your life nothing short of a hell, of you do. These are supposed to aid your walking in snow, but their short length and useless design will ensure that you will get stuck with this liability, since you have to give it back to the person who rented it out to you. 3. If you are wearing enough winter clothing, woollen inners, jeans, and waterproof fleece jackets, you need not rent out the dangris (full body waterproof jackets). However if you do rent them out, it’s good and will help you play quite freely in the snow. 4. Please please please do not leave your litter thre in the snow. Since this is alpine region, covered in snow for a long time of the year, and is an attractive tourist destination which attracts tourists from across the country and continents as well, it’s a responsibility shared by all of us. We need to keep this area pristine and as natural as it could be. 5. 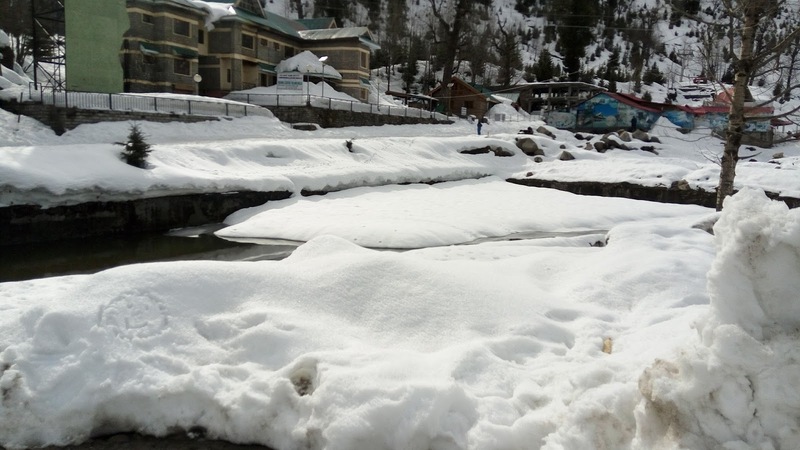 It’s not a good idea to have infants or very young kids with you while you are visiting Solang Valley. Do make sure that you do not have your very small kids with you here. Since it’s already late October, you might want to plan up your holidays in Manali this winter season. The best time should be from December to February. 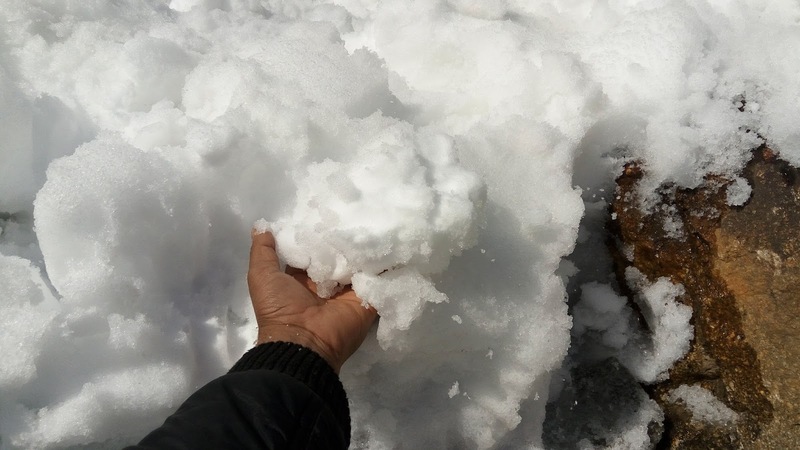 While visiting there in December, you can get lucky enough to be able to watch snowfall, things might get tricky, as mountainous tourist destinations are notorious for price spikes during extreme winter season, which sees prices of essential commodities skyrocket as transport routes get clogged due to heavy snowfall/landslides, often caused by heavy rains, making lives of tourists hell. Manali has a limited accessibility when it comes to reaching there. 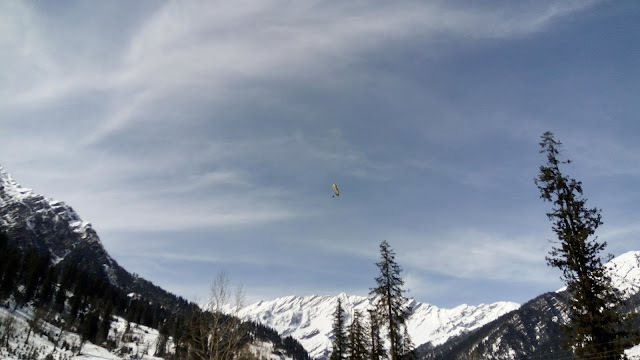 The only mode of transport to reach Manali is by road onoy, though there are other modes of transport which could be used to reach a point near it. The nearest Airport is at Bhuntar, in Kullu, which is around 50 kms from Manali and around 10 kms from Kullu city. Bhuntar Airport, also known as Kullu Airport can be reached from some major airports in India like those of the metro cities, Delhi, Mumbai, Kolkata, Chennai, Bengaluru and Hyderabad, as well as Chandigarh, though, seems private operators are either not really interested in operating flights on this route. Only Air India offers flight services to Kullu Airport. Though Manali is still inaccessible by train, the nearest major railheads are at Una, Kalka, Chandigarh, and Pathankot, but you still have to cover a large chunk of travel by road only. 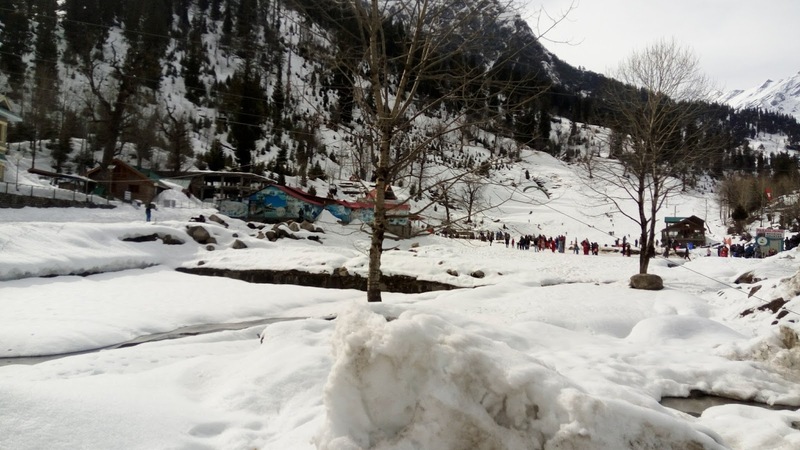 The best and the only option to reach Manali, there are quite a number of options including Luxury buses run by Government and Private operators, as well as private cab services to Manali. Manali has a good road-connectivity from Delhi, Ambala cantonment and Chandigarh, and ample overnight bus services ply connecting these major points to Manali. Usually an overnight bus service from Delhi to Manali can be taken which passes through Ambala, Chandigarh and other small towns like Bilaspur, Mandi and Surendranagar. The 570 km distance from Delhi to Manali is covered in around 13-14 hours by HRTC (Himachal Pradesh Road Transport Corporation) Volvo buses, which includes two stoppages, one during the night to allow passengers to have their dinner, and then early in the morning to have tea and early morning breakfast. Finally, the group. All of us have got considerably tanned walking and playing through the white expanse of snow, and appear darker after completing the trek up and down. The next post will take you to one more of the liked destinations which you might find worth visiting.